A London Tesco store has come under fire after it placed bacon-flavoured Pringles in a Ramadan promotional stand. Many Muslims do not eat or drink in daylight hours during the festival and feast after sunset. But pork is forbidden for many who practice the faith, prompting some to question Tesco’s decision to use Ramadan to sell the “smokey bacon” crisps at the Liverpool Street store. Vandana Priya Prasad (? @bornBohemian) tweeted: “The irony of it is hilarious! 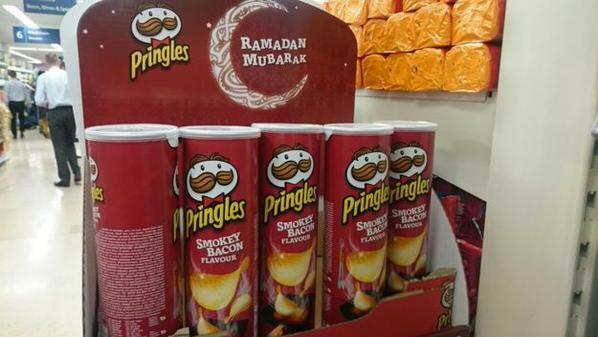 Someone at Tesco thought it would be a good idea to promote Ramadan deals using bacon-flavoured Pringles. In a statement to Buzzfeed, a Tesco spokesperson said that they realised the Pringles weren’t in the most suitable place and have now been moved. Although trying to promote pork-flavoured food to Muslims is generally a bad idea, the product in question doesn’t actually contain any meat. Smokey bacon flavour pringles are suitable for vegetarian, and don’t contain any pork. However, they’re not halal certified, so some Muslims prefer to avoid them.